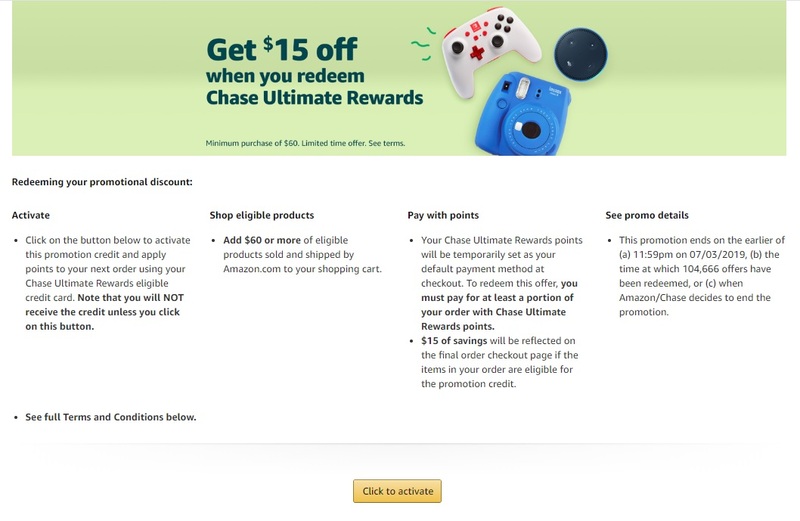 Amazon and Chase are once again partnering up to offer $15 off $60+ when you check out using at least 1 Chase Ultimate Rewards point to pay for your purchase. You definitely do not want to use more than 1 point, but it’s worthwhile to check for this promo since it can be an easy way to save on anything Amazon sells, including many popular third-party gift cards. This promotion starts at 12:00 am PST on November 22nd, 2018 and ends on the earlier of (i) at 11:59pm PST on 07/03/2019, or (ii) when 104,666 offers have been redeemed, or (iii) when Amazon elects to end the promotion. However, I went ahead and added the AirBnB gift card to my cart as shown above and at checkout it automatically applied points. Don’t forget to adjust that to $0.01 in points. Don’t forget to change that to 1 point. You might notice in the screen grab above that I only have 6 Chase points available. That’s because I keep a UR card that is nearly empty of points associated with Amazon for promos like this. That way, if someone were to hack my Amazon account, they (hopefully) will not be able to apply my entire Ultimate Rewards balance to an order. Overall, it’s great to see this promo return. It’s worth seeing if you’re eligible and activating/using this one on something that will save you money. Did this work multiple times for anyone else? I got the same “Your points will be applied at checkout but we were not able to activate the promo code. If you have already activated this code, your discount will be applied at checkout” message Nick mentioned. But, unlike Nick, I’m not getting a $15 discount when I get to the check-out page. Thank you for your interest in this offer. Unfortunately, you are not eligible for this invitation-only offer. I’m never eligible for the Chase Amazon offers but seem to always succeed with the AMEX offers. Any idea how to get eligible for Chase? That means it’s a no-go? Wasn’t for me. There’s a screen shot of that in the post. It still gave me the discount. Wow! Thanks. I saw the chase UR promotion but thought I had to use all points to pay for item. I used $1, 125 points and got $15 off! Thanks so much! !